1977-1980: William Kirker, Leslie Walker, Eloise Beach, Kathy Dorr, Fritz Kubisch, W. R. Paylen, Amy Jean Gilmartin, Edgar Smith. Adda Abendroth, Brazil; Luis Ariza Julia, Dominican Republic; David Barry, Jr., USA; Olwen Ferris, Australia; Mulford B. Foster, USA; Marcel Lecoufle, France; Harold Martin, New Zealand; Dr. W. Rauh, Germany; Raulino Reitz, Brazil; Walter Richter, Germany; L. B. Smith, USA; R. G. Wilson, Costa Rica; Robert W. Read. Any Excuse for a Fandango! Guzmania scherzeriana Mez. Photo by Jeffrey Kent. All plants live in company with species from various plant families; only man's mono-cultures form an exception, if we exclude the weeds among them. Also among growers there are some who prefer such mono-cultures. I know an orchid grower who will yank out any fern frond that appears in his pots. Except in the bloom season, his collection makes little impression on an outsider. But anyone who has collected bromeliads in the tropics or who has read carefully the travel reports of collectors knows that especially epiphytes grow in profuse harmony on branches of trees and shrubs. Many a tree hosts a whole botanical collection of various bromeliads, orchids, gesneriads, aroids, peperomias, epiphytic ferns, etc. It is this multiplicity of epiphytic life that comprises the tropical charm, which the grower in moderate climates wishes to capture in his home or greenhouse. Of course, the serious grower must limit himself to a certain plant family, whether it is cacti, orchids or bromeliads, but more and more attention is being given to companion plants. In a cactus collection, why should we not also see a few tillandsias on the cereus and why not some dyckias, hechtias or deuterochonias in the ground among the mammilarias and the parodias? Likewise, the orchid collector can attain a much more natural effect if he puts a few bromeliads, rhipsalis or ferns into the planting medium. Also a specialist in bromeliads will hardly remove a pleurothallis from the root system of an imported vriesea just because he is not a specialist in orchids. A few years ago, by the kindness of Senhora Bleher — Lotus Osiris — I received some branches from Brazil, which were covered with epiphytes. In these branches, I was well able to study symbiotic relationships among plants in the tropics. An example is shown in the accompanying picture of a branch about 60 cm long covered thickly with Tillandsia stricta and several shoots of a bifoliate cattleya. Now, after about 4 years, the orchids have bloomed and revealed themselves as Cattleya forbesii. Except for a few lichens, there is nothing on the branches that could be considered plant medium for the cattleyas and tillandsias. The cattleyas' air roots are well developed and cling tightly to the bark. On other branches, along with the preponderance of Tillandsia stricta, there were also Vriesea rodigasiana, Aechmea nudicaulis, Anthurium scandens (Araceae), Codonanthe gracilis (Gesneriaceae), Cattleya harrisoniana, Oncidium flexuosum and the little Lankersterella ceraciflora (Orchidaceae). Among them I observed the charming epiphytic fern Polypodium vaccinifolium crawling along the bark. I hung all these branches in the greenhouse on wire hooks. They are still thriving beautifully in spite of a lack of planting medium and continue to give me an attractive example of epiphytic vegetation. A NEW USE FOR SPANISH MOSS — It has now come to our attention that when smog experts in the South want to find out what sort of pollution is contaminating the air, all they have to do is analyze the Spanish moss growing in the area. Members are reminded that no portion of this journal may be used without the express permission of the editor. This also holds true of any of the publications issued by the Society. Enclosed with this issue is the ballot for eight members of the Board of Directors whose terms expire this year. Please choose those who can represent not only their area, but also take an active role in Society activities. Ballots must be received by May 15. "My shoulder aches, doctor, what should I use—heat or cold?" "Try heat — if that doesn't help, try cold." How often have you heard this? Often, I'm sure because I've said it many times over the past 26 years. The answer is legitimate because there is no one correct answer. For my bromeliads — should I use a fast draining potting mixture or something that retains moisture? How much moisture should it hold and for how long? Or, should I mount the plant on a piece of cork or a piece of dry log and leave the roots exposed? How often should I water and spray? How often should I fertilize? Which fertilizer — soluble liquid or the new solids? If I use a liquid should I spray it on or should I fill the cups or both? How often should I treat for insect pests? Should I treat prophylactically or only when I see an infected plant? How much light? I have been a bromeliad hobbyist-enthusiast for only 2 years and have about 50 different varieties, but it didn't take me long to learn that there is no one answer to these questions. This was obvious after attending club meetings and reading many back issues of bromeliad journals — from the national and New York society. Generalized gardening books are totally misleading. Doctor, how come my son, the same age as Johnny next door, is so much thinner and not as tall? Mrs. Jones, how come your other children are so much different from one another? If a child is healthy and active, then obviously mother is doing the right thing for that child. If our plants are healthy and growing, then obviously we are doing the right thing for our plants. The author of every article on the care of his bromeliads is right in the care of his bromeliads. My plants in the west window of a living room in an air-conditioned ranch house on Long Island can't be treated the same way as those in a greenhouse in Louisiana, or in a garden in California, — or in a greenhouse on Long Island. I recommend having fun and enjoying these fascinating plants. Growing them is the best and safest tranquilizer I can prescribe. By trial and error each novice will discover for himself the best growing media and planting method, the right light for his plants and when to water, spray, feed and treat for pests. 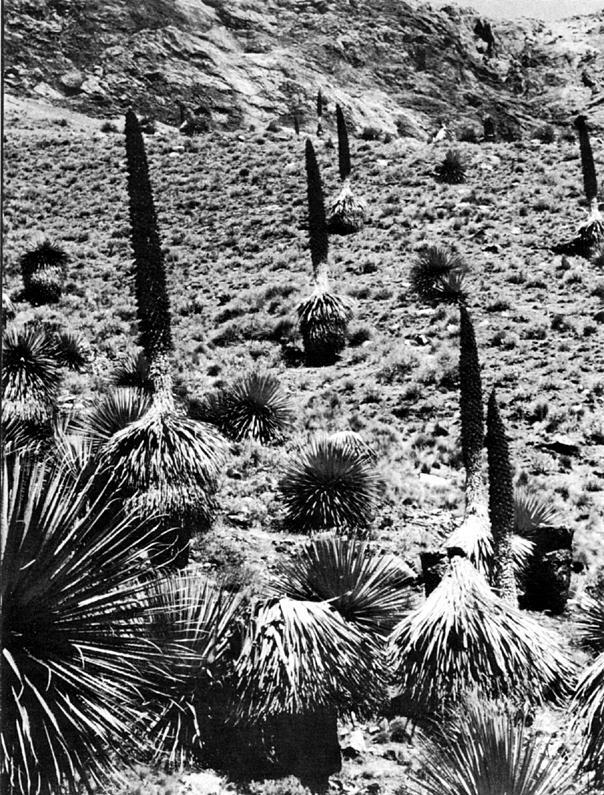 Puya raimondii growing in the Andean highlands at an elevation of 14,000 feet. On November 13, 1977 a most unusual fiesta was held in the small town of Comanche, Bolivia. To my knowledge this celebration is the only one of its kind in the world, for no other place could celebrate such an occurrence — the flowering of Puya raimondii. With the possible exception of the pineapple, I doubt whether there exist other festivals directly associated with a member of the bromeliad family. Publicity for the affair began to appear in the La Paz newspapers early in November, announcing the event in the Aymara Indian town of Comanche. The people of this village are dedicated to the quarrying of granite rock for construction purposes. The town itself is located about two hours by car from La Paz and is situated in an arid valley at an elevation of nearly 14,000 feet. A small rocky hill rises directly behind the village, and it is on this hill where at least several hundred puyas are growing. When I was there last October I noted approximately forty plants in bloom. The flowering season lasts from October into December, and this particular colony of plants has in recent years become quite a tourist attraction because of its proximity to the city of La Paz. Puya raimondii is the giant among all the bromeliads, reaching a height of 30 feet. The span of a generation from seed to flowering has been estimated at 150 years, after which time it dies. So when this remarkable plant puts out its flowers, it is a time of jubilation. It is my understanding that the Bolivian Institute of Tourism intends to continue sponsoring puya festivals in the coming years at the time when the plants are in flower. At the last festival a number of "conjuntos" or instrumental groups with dancers and vocalists performed native folk music. It is particularly interesting to note that one musical group calls itself "Los Puyas de Bolivia." Bicycle races and arts and crafts exhibits were also part of the festivities. Unfortunately, I was unable to attend the festival, but my earlier recent visit has prompted me to determine where other colonies of Puya raimondii occur in the Bolivian highlands which are relatively accessible by road and thus can be visited by tourists or bromeliad enthusiasts. The drive behind the search for life-forms on Mars and elsewhere in the universe springs from the simultaneous blessing and curse of terrestrial biology. A curse because every life-form so far examined works basically the same way. There are minor differences, but where it really counts, in the biochemical reactions inside the cells, a scale insect functions much as we do. Bromeliad cells work like the cells of an Oak. We want to find out if life must function as it does on Earth, or if there are different ways. The blessing, obviously enough, is that basic premises learned about one species may be extrapolated to another. This is the main reason why Canadian rats that develop cancer after exposure to Saccharin cause Saccharin to be banned for human use. 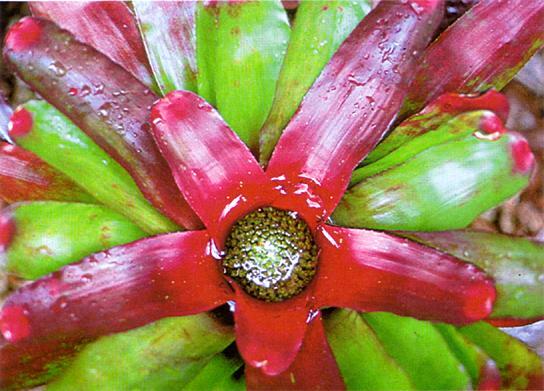 Bromeliad growers have occasionally seen a plant throw up two or more central inflorescences instead of the normal one. They marvel at this plant oddity and wonder how it happened — and perhaps more importantly, how they can make it happen again. Of course no one can state with certainty how and why it happens, but that previously mentioned biological blessing gives me the opportunity to speculate on the subject. The speculation is a simple one. It might occur by the same mechanism that causes identical (not fraternal) twins in the human population. The normal route a fertilized egg follows is to divide millions of times, each cell assuming its proper role, until a fully developed human individual is created. However, due to uncertain reasons, the fertilized egg rarely splits into essentially two identical fertilized eggs which then independently develop normally. Identical twins are the result. It seems logical to assume that multiple inflorescences in bromeliads are formed in the same manner. At the time of bud-set in a plant, the precursor to an inflorescence may be a single cell. Ideally, that cell would divide normally to form a single inflorescence. But that rare identical twin division may occur in that single cell, giving rise to two inflorescence-precursor cells which will develop into two full inflorescences. 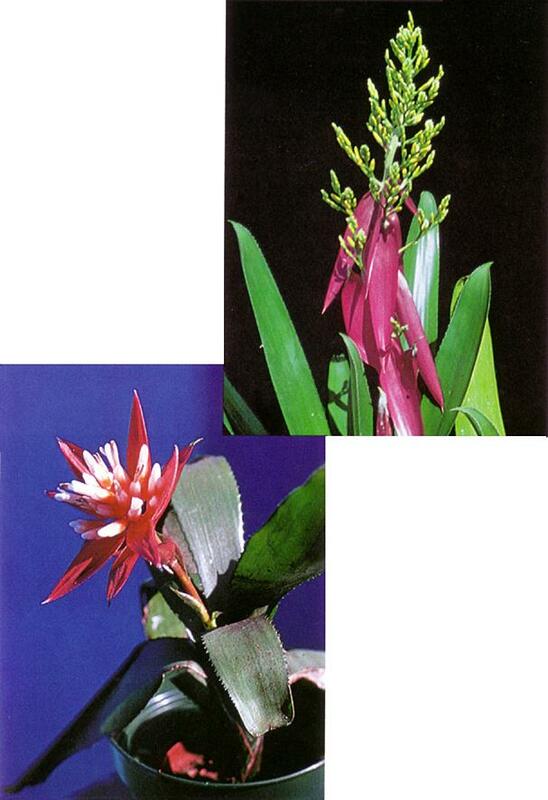 Just as human triplets and quadruplets are formed, bromeliads may also form triple or quadruple inflorescences. Probably the more central and interesting question to bromeliad growers is, 'How can we create multiple inflorescences in our plants'? I'm afraid that I can provide little assistance on that point. However I can make a few suggestions. First, just as fertility drugs in humans tend to increase the chances of multiple births, inflorescence-inducing chemicals (calcium carbide, Ethrel, etc.) may increase the tendency toward multiple inflorescences in bromeliads. Essentially the multiple flower head phenomenon is the result of a mutation. The chances of that mutation occurring should increase in the presence of a flower-inducer by definition must be present at that crucial moment. My second, and perhaps best, suggestion is that if you have a bromeliad that produces multiple inflorescences, follow the pups to see if they do also. If they don't, then watch their pups in turn. The phenomenon just might happen again if your plant line has a genetic tendency toward this abnormality. Human families with a history of twins tend to have twins at higher than normal frequencies. They may also happen in bromeliads. 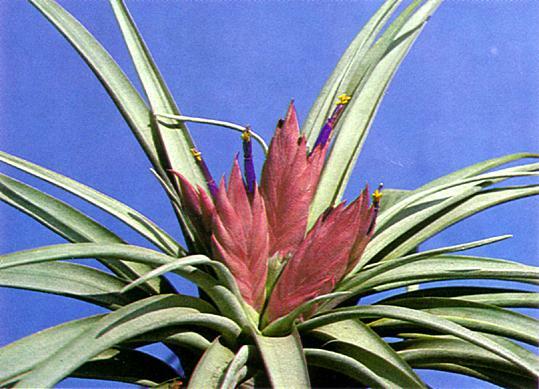 Bromeliads such as Tillandsia multicaulis and T. carlsoniae, which normally bear multiple inflorescences, lend support to this theory. Presumably at one time in their evolution, a single plant produced a multiple spike. The pups may have acquired a genetic tendency so that through the years multiple spikes became a normal occurrence for that plant line. If one day a bromeliad presents you with a beautiful twin spike, try to self-pollinate it. If any genetic tendency is present in the parent, it might be passed into the seeds, and therefore the plants grown from them. 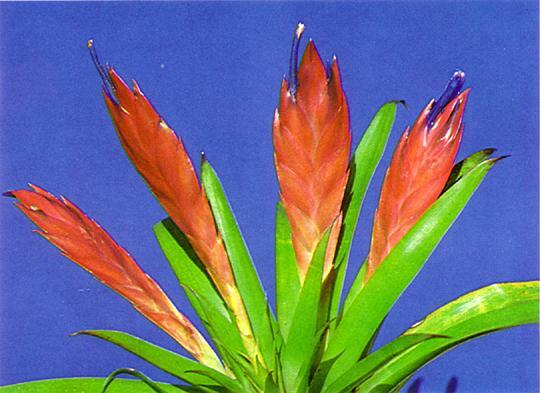 Our bromeliad hybridizers have given us beautifully colored leaves, larger and more branched inflorescences, and hardier, more prolific plants, but never a new plant which consistently produces multiple inflorescences. By following my suggestions, and given time, a skilled grower may someday present us with a truly magnificently adorned bromeliad line. Until that day, we can only dream of the likes of a multiple headed Aechmea chantinii. IF YOU ARE GOING TO MOVE — Please notify the Society six weeks ahead of time if at all possible. It is very costly to the Society when the Post Office has to notify us of a change of address, as well as causing the loss of your journal. For such journals that are returned, we must ask that you forward one dollar to cover the cost of postage. Aechmea distichanta var. schlumbergeri 8 days from sowing. New converts are probably the worst types. I'm one. After a brief brush with the Bromeliad Society a few years ago, I left it alone until late last year. Some nurseries started stocking the plants, several local people became interested, and then we decided to start a chapter. Now I have 65 different species of 16 genera and I'm still looking. My wife and I are about to build a conservatory/greenhouse. My hobby for over 20 years has been photography. I'm also trying to grow bromeliads from seed. These interests have all come together to give an outlet for my particular interest in photography, macrophotography. Macrophotography is the photography of small objects that are too large for a microscope. I've done a great deal of this over the years and have worked out a few simple approaches that I would like to pass on to you. FILM: First, you must choose a film. I like to use Kodacolor, particularly the relatively new ASA 400. If you get a good color negative, you can have any number of excellent slides made and any number of excellent prints, all as good as the negative. If you get a good slide, you have one good slide. You can get any number of inferior copies or prints. They are never as good as the original, in my opinion. Choice of film helps choose the type of light you will use. LIGHT: I like electronic flash, off camera. The problem with most flash pictures is that the light is mounted on the camera. This head-on lighting gives flat, blahh results. You need shadows to give depth and life to a picture. So, you want the light to come from somewhat of an angle. Secondly, when the lens is close to the subject, as it is in macrophotography, the lens itself may shade the subject unless the flash is off to one side. Thirdly, you want to place the camera according to the magnification you select. The light may have to be much farther away. I might take a picture with the lens 3 inches from the subject and the flash 24 inches away. In order to determine the distance from the light to the subject, you have to set up the camera, determine the magnification, then calculate where to put the flash to get the exposure you want. Let's set up the camera and come back to the exposure. CAMERA: To take this kind of picture, you must have a camera with interchangeable lenses and through-the-lens focusing. Although close-up lenses are available, they cannot really be satisfactory. Putting a close-up or a filter in front of an expensive lens destroys the calculations that went into the lens. It cannot perform up to its potential. You are taxing the lens enough, coming this close, without adding this burden. You must have a bellows or a tube set. A 35 mm slide is 36 mm long and 24 mm wide. If you photograph something that is only 4 mm by 6 mm, you would need 6 power to fill the negative. However, to do this with a 100 mm tube or bellows, you would need a 16 mm lens. Or you would need 300 mm of bellows or tubes to do it with a 50 mm lens. And even more important, the depth of field would be so small the picture would not be in desirable focus throughout. A compromise is needed. With a normal 50 mm lens and a 100 mm tube set or bellows, you can get up to 2 times life size on the negative, or about 6 power on a jumbo print. You also get reasonable depth if you use a high f number (small aperture). SUPPORT: Vibration is absolutely lethal in close-up photography. Electronic flash eliminates a lot of this due to its high speed (commonly around 1/800 second). Secondly, you will need to stop down to get the depth you want. You will have difficulty aiming the camera when it is stopped down. So a tripod or other firm support is mandatory. A cable release or delay timer is very helpful. Frame the picture you want in the viewfinder and focus by moving the subject. MAGNIFICATION: There are two easy ways to determine this. First, you can measure it by putting a metric ruler in the plane of the subject and reading the dimension directly. If the picture is 18 mm long (and you know the negative will be 36 mm long), the magnification is 2. Same A. distichanta several days later. I think it is easier to measure the extension you have added between the lens and the camera. The magnification is just this extension divided by the focal length of the lens you are using. For instance, if you have a 50 mm lens on a 100 mm extension bellows, you again have a magnification of 2. EXPOSURE: Well, here we are. You have to know the guide number for your film with your flash. My guide number for Kodacolor 400 is 200. (The guide number is the product of the f number you are using and the distance of the flash from the subject in feet.) To get maximum depth of field, I use the smallest aperture on the lens. My 50 mm lens goes down to f 22. When one extends the lens, this changes the actual f number and therefore the exposure required. Here is the secret that eliminates all the tables for close-up exposures. The increase in exposure, in stops, is equal to the magnification plus one. When a lens is set at f 22 and a magnification of 2, its actual aperture is f 64! A flash with a guide number of 200 has to be 3 feet from the subject. Let's take another example. Say we are using an 80 mm lens, an aperture of 16 and 100 mm extension. The magnification then is 100/80 or 1¼. We will need 2¼ stops extra exposure. Another way of putting it is that our aperture is really between f and 32 and f 44, probably about f 36. With my guide number of 200, the flash would have to be six feet from the subject (200/36). You see, it can't be on the camera. There you have it. Pull the delay trigger and you have your picture. If you find the pictures underexposed, decrease the guide number next time. Overexposed? Increase the guide number. When you find the one that works, you will have no problems. SUMMARY: Support the camera rigidly. Move the subject until it is in focus at the magnification you want and at the smallest aperture. Set the aperture to the smallest opening (largest f number). Calculate the magnification from the extension and the focal length of your lens. Calculate the actual f stop by increasing the f number by a number of stops equal to the magnification plus one. Calculate the distance for the flash by dividing the guide number by the actual f number. Set the flash at this distance and shoot! SAMPLES: I put fresh Aechmea distichantha v Schlumbergeri seed in a pot with an insectivorous plant, Drosera spathulata. There was a moss present as well. One of our local chapter's projects is trying seed germination in mosses. The seed germinated in three days. Several days, later, I photographed it by the above method. I have photographed germinating seeds of several other varieties obtained from the seed chairman. 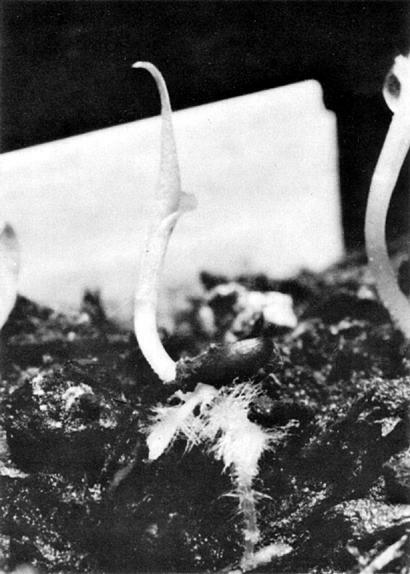 The display of root hairs that occurs on initial germination seems quite beautiful to me. 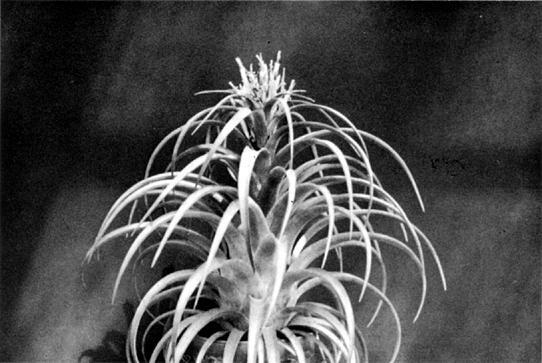 Auxins, ethylene, and ethylene producing chemicals have been used for years to produce flowering and fruiting in pineapple and other bromeliads. 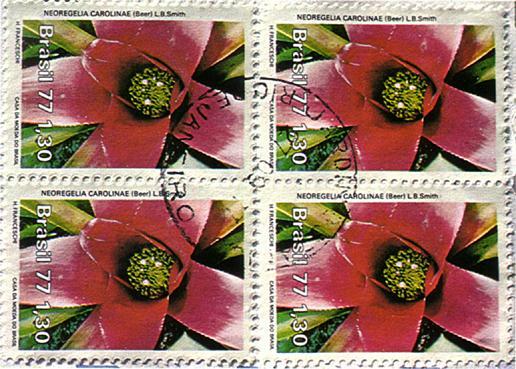 The propagation of bromeliads by tissue cultures requires a longer list of growth substances. Probably other new uses for the many known natural and synthetic plant growth substances in the breeding, propagation, and production of these plants will be discovered. The substances are usually applied in very low concentrations. This means that those purchasing the pure chemical compounds will need to have chemical glassware and balances of good quality in order to prepare the needed dilutions. Often the obtaining of the desired chemicals will not be easy. Many of the manufacturers sell only wholesale or to professional accounts. Some of the large chemical companies may manufacture only one or perhaps even no chemical of this type. The organic chemicals division of Eastman Kodak Company has always offered an unusually long list of organic chemicals. Another possibility as a source of chemicals would be the scientific supply companies located in many of the major metropolitan areas which supply chemicals and scientific apparatus to school and industrial laboratories. They can often supply chemicals of this type. Flow Laboratories, 1710 Chapman Avenue, Rockville, Maryland 20852 and 936 West Hyde Park Boulevard, Inglewood, Ca 90302. Grand Island Biological Company, 3175 Staley Road, Grand Island, New York 14072 and 519 Aldo Avenue, Santa Clara, CA 95050. In many cases, the experimenter will prefer to purchase growth substances in various kinds of carriers which are properly diluted and present less difficulty in practical use. Growth substances have been applied to plants in gaseous form, as with ethylene, in aerosols, in water solutions or with other solvents, and in solid carriers such as lanolin pastes or talc powder preparations. Many such preparations are now widely available in retail nurseries, seed stores, garden centers or from a number of the mail order seed establishments. Some very useful agricultural chemicals are available only in large containers. For instance, Princep is a safe ideal control for weeds in pots of orchids such as cymbidiums, especially with oxalis. Unfortunately, this compound along with many others, is available only in sizable drums. In every major horticultural area there will be one or more large jobbers who supply agricultural chemicals and supplies. Some of these are highly specialized and their resale policies vary widely. In the greater Los Angeles area several specialists in orchid growing supplies gladly sell to amateurs and one even provides a delivery service at a very nominal charge. Some of these firms issue catalogs, some of them quite elaborate. Sometimes a cooperative local dealer will be able to obtain desired chemicals or other products from sources which sell only to professionals. In order to illustrate the range of commercial growth substance preparations which are available commercially, we may examine the catalog of a large centrally located jobber who sells only to the horticultural trade. (A. H. Hummert Seed Company, 2746 Chouteau Avenue, St. Louis, Missouri 63103). They offer the Rootone and Hormodin powders in a range of different concentrations for promoting the rooting of cuttings, a vitamin-hormone solution for aiding in transplanting, several hormone type weed killers and Off-Shoot-O for chemical pruning. They offer two different preparations for promoting fruit setting and growth, and also Florel (ethephon) which is an ethylene carrier useful in promoting the flowering of bromeliads and it has other horticultural uses. Several preparations for prolonging the life of cut flowers are listed, and also two gibberellic acid products, Gib-Tabs and Wonder-Brel. The growth retardants, Alar, A-Rest, B-Nine SP, Cycocel and Phosphon are listed. Other products not in this list have been noticed recently in some retail nurseries in the Los Angeles area. Some of these products are apparently prepared by small firms and may have a local rather than a national distribution. Some very competent plant scientists believe that growth substances will in the future surpass plant breeding as a way to increasing the performance of plants. However, we seem to be on the verge of some radically new methods in genetic engineering and personally we prefer to leave predictions to the economists. Plant growth substances are important commercially now and doubtless they will play an even more important role in the future. 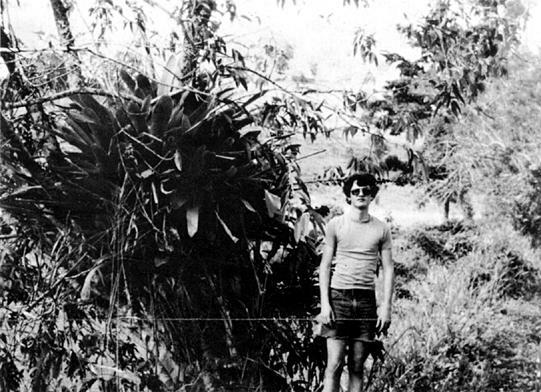 On December 17, 1976, we started on what, for me, was to be a great bromeliad adventure. Being just 14 years old, I had not had the chance to do much in the way of collecting plants. We left the Detroit Metropolitan Airport in the morning, stopped in Nassau, flew over Cuba, and then went on to Jamaica. We landed in Montego Bay and then took a minibus ride to Ocho Rios. Along the way I sighted several large bromeliads growing high in some trees. I only saw epiphytes growing inland; I believe this is due to the salt spray from the ocean. When we arrived at the hotel it was dark, but the next morning I began my search. I got up early and found multitudes of pitcairnias clinging to the rocks above the ocean. Along with the pitcairnias, I found Oncidium orchids, maidenhair fern, and other exciting plants. I filled my bag full of pitcairnias that day. 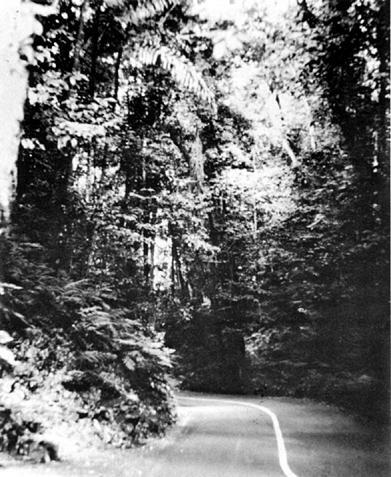 A few days later we went on the Ocho Rios highlight tour, which included going up Fern Gulley, an ancient riverbed turned into a major road. As we entered the Gulley, I noticed Tillandsia recurvata clinging to the telephone wires. Farther up, I saw some more of the pitcairnias clinging to the rocks. I also noted large aechmea clumps on the ground, and I looked up to see them growing way up where the sun could reach them. I also noticed a small guzmania seedling perched up where I couldn't get to it. After a while, we came out of Fern Gulley and drove for another mile or so until we came upon a really nice spot where we could see for several miles. Here, while everyone else was taking pictures, I climbed over into a field and got some small T. utriculata which abounded in this country. On the way back down to Ocho Rios, before we entered the Gulley, I had the driver stop and I paid some children a dollar to climb up in a tree and get me "parasite air plants", T. utriculata. Then we were back on the road again, off to Sha Park Gardens, where we were to have a guided tour. There were beautiful orchids blooming on the large palms, along with some T. recurvata. Among the plants in the gardens were mimosa sensitive plants growing on the lawn, huge crotons, Ananas Comosus, a huge 56-year-old Ficus Benjimina a good hundred or more feet tall. We then went to Dunn's River Falls, no really interesting bromels there, only a few pitcairnias. On the way back to the hotel, we stopped at a shopping center where I saw an enormous hohenbergia clump that was really beautiful! I also found and took a clump of T. recurvata. Later, back at the hotel, I cleaned my catch. The next day we went and toured a banana plantation, Brimmer Hall. At first the trip was uneventful because I saw no bromels at all! Then, near the end of the tour, we stopped underneath a huge tree crammed with bromeliads, orchids, cacti and lots of rhipsalis. Our tour guide was with us, and he arranged to have the coconut tree climber go up this one for me. He was up faster than a blink of an eye, and a shower of rhipsalis, oncidium, epidendrum and encyclia orchids came down. At the base of the tree I found an enormous clump of Billbergia pyramidalis. It was growing under the bushes near the tree; it had apparently fallen there. After the plants were loaded on the cart, we left for the minibuses to take us to the hotel. While we were waiting, I shook out the billbergia clump and out came ants, roaches, termites, slugs and many other assorted bugs. I spent the rest of the afternoon cleaning my new plants. Beside a large clump of aechmeas growing along the road. The next day my father and I rented a car and went collecting. We drove west to Ocho Rios, then went south into the mountains via Fern Gulley. We stopped to look for fallen bromels, and found some really nice ones. As we were going back to the car, a man hopped off his motorcycle trying to sell us souvenirs. Everyone in Jamaica is selling something, from wood carvings, marijuana to dresses made in Hong Kong! We drove up and out of Fern Gulley into the open pasture land, where at first there were only T. utriculata and hohenbergia species. After driving a little, I spotted some Guzmania monostachia growing on a tree and stopped to collect some. Then we drove some more and stopped at a small tree to collect still more. At that one tree I found T. setacea, T. balbisiana, more guzmanias, and some oncidium orchids. I saw some tillandsias with beautiful red flower stalks but I could not get to them because they were growing in a field where some angry looking pigs lived! We kept on driving toward Moneugue, occasionally stopping to collect some plants. After Moneague[sp. consistency], we turned north on another road, and along this road I found Guzmania lingulata, T. fasciculata, and a tillandsia I have never before in my life seen. On the way back to the hotel, I saw Cattleya orchids high up in a tree, and then I found and took a neoregelia that I found on a small tree. I also discovered some miniature orchids on the same tree as the Neo. Back at the hotel I cleaned the plants all afternoon long. The next day I let them all dry out before the long trip home. After they dried, I packed some to be shipped to Miami to be inspected. I put the rest in a box that I would bring with me on the plane. After the long flight, we landed in snowy Detroit, and I managed to get the plants through customs. I would like to thank the people who made this trip a success: my parents and my sister Clare, Dr. Louis Wilson, and the Island of Jamaica. A GREENHOUSE AS A MEANS OF SOLAR HEATING — When erecting your greenhouse, why not attach it to the house proper, making it an extra room. By adding such a room to your house, you can draw cool air from the house into the greenhouse through a floor vent. The air is then heated and returned to the house through a ceiling vent. One solar innovator heats his entire livingroom from heat collected in his fiberglass greenhouse. Neoregelia 'Fairy Paint' — One of the lovely specimens seen at Kent's Nursery. In this writer's opinion there is no finer commercial bromeliad establishment to be found anywhere, either in the United States or abroad, than that which is known as Kent's Bromeliad Nursery of California. True, there may be those which grow a larger number of bromeliad plants — for example, wholesale outfits which sell Aechmea fasciata by the thousands — but there is probably none that presently can boast of having over 1,600 different species and cultivars for sale. Even this number increases daily, as more fine hybrids are sent from the European market and collectors in the field send in their findings in Latin America. Situated in the town of Vista, some one hundred miles south of Los Angeles, the nursery enjoys one of the most benign climates in this nation. 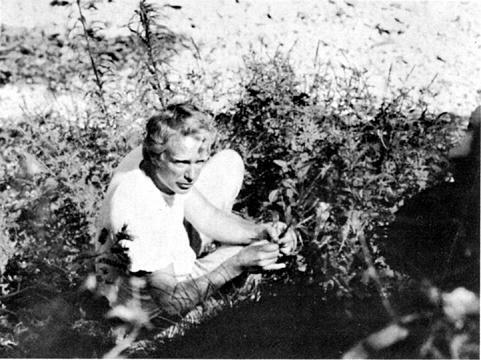 To attest to the superlative growing conditions are the number of other prominent exotic plant growers who may be found in this area: Paul Ecke, with his world-renowned poinsettia fields; Howard Asper, with his hillsides covered with South African proteas; Paul C. Hutchison and his well-known Tropic World, to name only several. It all started as a hobby. Leonard Kent, prominent Los Angeles physician, felt the need of a form of relaxation to take him away from the cares of his profession. He had been fascinated by the bromeliads he had seen in Europe and in this country and so purchased a few, growing them in his backyard. The collection grew and grew, as Dr. Kent made contact with collectors in South America and with the great nurseries in Belgium and Holland. Finally, the small city lot was so crowded with bromeliads that in order to make room for new arrivals he began to sell his duplicate plants, and so what started out purely as an avocation became a commercial undertaking. Of Dr. Kent's three sons, the two eldest became interested in the plants and about three years ago began to consider them seriously. The eldest, Jeffrey, a university graduate in biochemistry, had done some summer research and was considering working with plants as a career, and he decided after a brief employment in a nursery to give the bromeliads a try. A suitable location had to be found for a nursery such as he and his father envisioned: it must not be too far away from Los Angeles, it must be in a good growing area, and it must be large enough to provide for the expansion of the business which they anticipated. Fortunately, they found seven acres in San Diego County near the town of Vista. However, at the rate the business is growing, one wonders whether seven acres will be sufficient to serve their needs. Jeffrey, a bachelor who has a comfortable house on the property, acts as manager. Dr. Kent is the senior advisor to the firm and is able to spend two days a week at Vista. He looks forward to the time when he can retire from his medical practice in Los Angeles and spend his full time with the plants. Larry, the second son, a UCLA graduate with a degree in history, now is a salesman for the firm. His territory covers the nurseries in southern California. But many of the sales are unsolicited. Kent's has a reputation for the quality and variety of its plants the world over, and orders and inquiries come from as far away as South Africa. Michael, the youngest son, is still in college. Mrs. Kent is not left out in the cold, but gives her advice when needed. At present the nursery consists of three large greenhouses covering an area of over 40,000 square feet. More houses will be erected as the need arises. Temperature in the houses is so regulated that they contain within their confines a number of microclimates to accommodate the great variety of plants — some coming from the high Andes, others from Amazonia, some from dry, hot areas; others from cool, damp rainforests. As one enters the houses he is amazed at the splendid, if not perfect, condition of each plant. True, some are a little sorry-looking, having just made the journey from some far-off place, but these plants are kept for reproductive purposes — only the finest of specimens are sold. Large as the catalogue is, it does not give a true picture of the great variety of bromeliads being raised. Not only are plants being imported daily, but Jeffrey is continuously growing more and more seedlings and is now trying his hand at hybridization. Guzmanias seem to be favorite with the Kents — nowhere can one find a larger selection of the newest European hybrids as well as the most recently discovered species found in Colombia and Ecuador. The catalogue lists 136 different kinds for sale, such as the one shown on the cover of this issue, but there are many, many still unlisted. There are thousands of seedlings of the Belgian cross G. 'Orangeade' described in the last issue for 1977. These seedlings are being grown to a more mature size, so that they will be able to withstand the rigors of a novice's greenhouse. If a person is looking for a rare aechmea, Kent's in all probability will have it, for they list hundreds of kinds for sale. Jeffrey has become fascinated by Aechmea chantinii and has hundreds, if not thousands, of seedlings. He is particularly intrigued by the great variability in the color and in the markings of the foliage and is endeavoring to classify the plants by certain marked characteristics. He also has over a dozen chantinii crosses, both old and new, listed for sale. No trip to southern California by a bromeliad enthusiast would be complete without a visit to this great nursery. An appointment is necessary, as the nursery is not set up for walk-in trade. Most of its business is in shipments to dealers and collectors, but serious growers and horticultural groups are welcome to visit if advance notice is given. PAPER FROM PINEAPPLE LEAVES — High-grade paper has been made from pineapple leaf pulp by Feng-jyi-Chang at the National Chunghsiung University, Taiwan. The yield from chemical pulping exceeds 75 percent, Dr. Chang says, and the product could be used for special purposes, such as banknote paper. Taiwan has some 15,000 hectares of pineapple plantations. This lovely new hybrid, a cross between Tillandsia brachycaulos and Tillandsia streptophylla, was made in July, 1967. When the seeds were mature, a full year later, they were spread over the surface of the same tree fern slab on which the seed parent, T. brachycaulos, was growing. Within two-and-a-half years, the little seedlings grew into strong tufts of thread-like leaves two inches long. They were then removed and potted into dark brown osmunda in small individual pots. During the next year, growth accelerated noticeably, leaves thickened, and overall-spread increased to nearly six inches across. By 1973, and nearly full grown, they stood about nine inches tall and looked just like little fountains of arching leaves; their grace and symmetry made for stunning plants. In fact, they became the center of attraction among all the other tillandsias in our greenhouse. Furthermore, they had such a new look from any other tillandsia seen in this area that a friend asked me to display one at the Greater New Orleans Bromeliad Society Show to be held that month. Needless to say, this beautiful little plant generated quite a bit of excitement. In July of the same year, several plants came into bloom for the first time. What a surprise it was to see the upper half of the plant turn from a gray-green to a yellow-orange, then to orange-scarlet, and finally, to a deep rose-red! The thick, leafy scape is straight; the inflorescence is densely bipinnate, forming a tight head of flowers. Sepals are green to rose-red; petals are deep blue to violet — a striking contrast set against the rose-red color of the leaves. The plant remains in bloom for three weeks or more, while the rose-red color endures for still another two or three weeks. It is with a great measure of satisfaction and pleasure that I can name this new tillandsia hybrid — my first to bloom — in honor of a man who has gained great esteem as an authority on bromeliads; one who has been a dear, personal friend for nearly twenty years; namely, Mr. Eric Knobloch, of Mary Plantation in Dalcour, Louisiana. Dr. Benzing in the field. A native Ohioan, David received his PhD in botany from the University of Michigan, and is currently a professor of biology at Oberlin College in Oberlin, Ohio, where, in addition to his teaching duties, he is presently involved in several lines of bromeliad research. His interest in this plant family began when, as a youth, he saw bromeliads growing wild in southern Florida. He became intrigued by those "plants which live on air" and in 1968 began to seriously investigate their nutritional strategies. A dedicated young scientist, his work has been restricted to the physiology of bromeliads rather than taxonomy or systematics as that of most other workers in the scientific study of bromeliads. His investigations have dealt with the anatomy, photosynthetic behavior, mineral nutrition and water balance mechanisms of these plants, and have resulted in 16 articles on bromeliads in technical journals, as well as several others in the Journal of the Bromeliad Society, Inc. Many of these studies have been supported by the National Science Foundation. The work in which he is currently involved includes studies designed to determine why certain tree species serve as better bromeliad hosts than others and the effect, often negative, of bromeliads on their host. Also under investigation are the factors affecting seedling establishment. Another project on which he is now working is the preparation of a book designed to introduce the bromeliad enthusiast to the botany of bromeliads. It will cover the basic structural and functional aspects of plants using bromeliads as examples, and is intended to make such basic plant functions as photosynthesis and nutrition, as they relate to bromeliads, understandable to the bromeliad hobbyist. It will contain material of interest to the novice and advanced bromeliad grower alike. An accomplished artist, he is preparing explicit line drawings which explain the various subjects covered, as well as beautify the text. 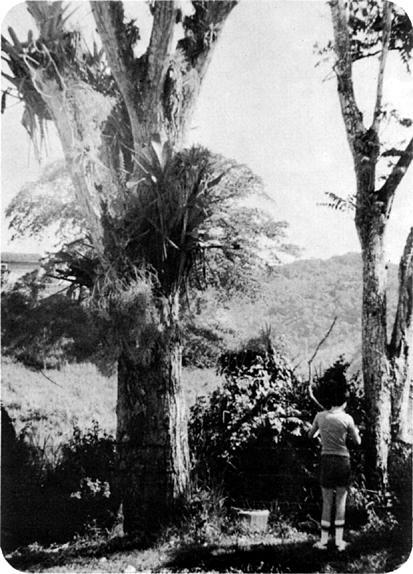 He recently spent several weeks in Mexico collecting material for a variety of additional studies, among them, the difference in nutrient mobilization and allocation for sexual and asexual reproduction in the various types of bromeliads, factors influencing the light requirements of bromeliads, and the significance of the great variety of foliar trichomes found in the bromeliad family. David is currently serving his third term as a director of the Bromeliad Society, Inc., and has delivered lectures to three World Bromeliad Conferences, as well as to Bromeliad Society chapters in Florida, Texas, and California. This species was first discovered by Andre in 1888 who found it growing near the town of Servita on the eastern slopes of the Colombian Andes. Here it grows on rocks or on trees in moist wooded areas and on banks of rivers at elevations ranging from 500 to 5,000 feet. It is a large striking plant that is worthy of a place in any collection. It has glossy light green leaves that measure 3 feet in length and 1 inch wide at their center. The branched inflorescence, which somewhat resembles that of Aechmea chantinii, is 1½ feet long. The upright bracts are rosy red; the petals, orange-red. It is still a rare item. This charming little aechmea first came to the attention of growers in California when it appeared in shipments received from Amazonian Colombia. At that time it was new to local growers and it was not until it had bloomed that it was identified. It is a small stoloniferous plant, not much more than a foot in height. Its 3 to 6 leaves, about one inch in width, form a cylindric rosette. At first sight, if not in bloom, the plant might be mistaken for a billbergia, and was so designated when first described by Martius in 1830. It was called "corymbosa" because of its broad, more or less flat-topped indeterminate flower cluster. Coming as it does from the hot humid forests bordering the Amazon River, it would seem to be definitely a greenhouse subject. It is epiphytic, growing mostly on trees or on rocks in shaded areas at elevations of around 600 feet. There are two forms — one with plain green leaves, the other discolor. Both are in the trade. Travelers to tropical countries have long been aware of the strange illnesses and infections they can contract. Usually if they get a few appropriate shots before leaving, observe sensible eating habits, and practice good sanitation, they are quite safe. And if with all of these precautions something sinister does develop, modern medical science can usually cure it. So what is an article like this doing in a journal devoted to bromeliads? Because there is one disorder that all of these precautions won't prevent or cure, and bromeliad collectors visiting eastern South America and most of the Caribbean islands need to be aware of it. This is a parasitic ailment acquired in the streams, lakes, canals and other bodies of water where collectors may try to clean their bromeliads. And seeing the local people swimming or wading in the waters does not guarantee that it is safe; these people often have the parasites and just help to continue the life cycle of the schistosome. There are three major species of schistomes that range from Africa to South America and to the Orient, but we will concern ourselves with Schistosoma mansoni, which is the culprit in bromeliad growing areas. A heavy infection on the first exposure is more dangerous than a number of light episodes. The life cycle begins with the egg leaving man through the urine or feces. After hatching, the larva has six to eight hours to penetrate an appropriate snail. The suitable snail hosts are Biomphalaria, Australorbis, and Tropicorbis. Once inside the snail one larva multiplies asexually into more than 100,000 second-stage larvae, and after about 4 weeks the snail begins to send forth thousands of these second-stage larvae each day for many months into the streams or lakes, where they swim about in search of humans or other animals. They are approximately one-tenth of an inch long and can penetrate the skin in three minutes. Once inside the body the larva travels through the blood stream to the lungs, which it reaches within twenty-four hours and where it undergoes further development. Then it goes to the liver, where it grows to be about one quarter of an inch long and mates. The couple moves on to the intestines or bladder and produces from three hundred to three thousand eggs per day over a possible life span of thirty years. Less than half of these eggs pass out of the body while the remainder stay in the tissues, impeding the flow of blood, resulting in high blood pressure, hemorrhage, lung damage, heart failure, or progressive cirrhosis of the liver. The worm occasionally travels to the spinal cord and causes paralysis of the arms and legs. There is no vaccine to prevent schistosomiasis, and the drugs used to help the patient have severe and sometimes fatal side effects. Most of the countries with the problem are poor and have little money to spend on eradication. The main efforts at control are expended towards education of the citizens, provision of sanitary facilities, and destruction of the snails that are necessary to the life cycle of the schistosome. It is estimated that ten percent of the people from Puerto Rico living in this country are infected; so, obviously, many people function while harboring these worms, especially if they have mild cases. However, it is not a disease to be taken lightly in view of the potentially dangerous results and in the absence of a safe and effective antidote. And even though the waters of Mexico, Central America and western South America are considered to be safe, it's probably a good idea not to gather snails or use the water where snails abound. After all, the parasite traveled with the slave trade from Africa to South America, and one of the snails was found in the swamps of Louisiana during World War II. Let's not be the first to discover the infection in some new area. Hunter, George W., Frye, William W., and Swartzwelder, J. Clude. A Manual of Tropical Medicine. Philadelphia and London, 1966. Jeffrey, H. C. and Leach, R. M. Atlas of Medical Helminthology and Protozoology. Edinburgh, London and New York, 1975. Warren, Kenneth S. "Precarious Odyssey of an Unconquered Parasite," Natural History, LXXXIII, No. 5 (May 1974), 47-52. 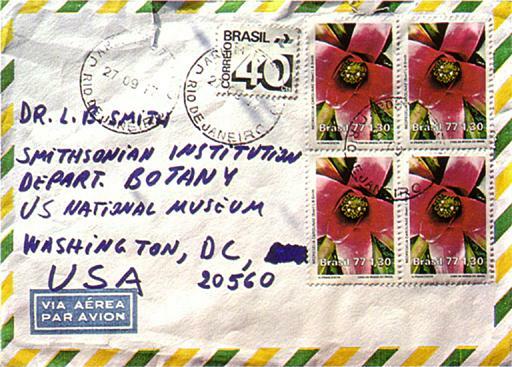 Consider the keen delight of our honorary trustee Dr. Lyman B. Smith when he received the envelope, shown on the opposite page, bearing a Brazilian stamp commemorating bromeliads, and Neoregelia carolinae (Beer) L. B. Smith in particular. The author citation is given on the stamp margin. Of all the bromeliads, there is perhaps none that has gone through more confusing changes in nomenclature than has the Neoregelia. Dr. Smith summed up the situation in the September-October 1958 issue of the Bromeliad Society Bulletin, and for those who do not have this issue, it is given here. "In order to understand the reason for using the name Neoregelia for a genus of bromeliads with flowers nested in the center of the rosette, we must go back to the first publication of its oldest species. This was Tillandsia concentrica of Velloz in his "Flora fluminensis" in 1825. He was right only in calling it a bromeliad, because Tillandsia and Neoregelia are in different subfamilies, the first with dry capsules, the second with berry-like fruits. "In 1857, Beer recognized this fact and in his monograph transferred the species to Bromelia. Now it was in the right subfamily, but Bromelia has the bases of the stamens forming a tube and they do not do so in Neoregelia concentrica. Mez noted the lack of a stamen tube and in 1891 changed the species to Nidularium, which was almost right but not quite. In true Nidularium the flowers are sessile while in Neoregelia they are on short stalks or pedicels. However, Mez did recognize this difference by following the lead of Lemaire in dividing Nidularium into subgenera. "In the meantime Lindman had proposed using Regelia as a genus instead of a subgenus, and at this point we pass from questions of flower structure to questions of nomenclature and of its international code of rules which most botanist now follow. Regelia as a subgenus of Nidularium was perfectly good, but as a genus it could not stand because of the name already had been used for a genus in the Myrtle Family. "Another name had to be found for it and in 1896 Mez applied Aregelia of Otto Kuntze to the genus, but this also had a flaw. 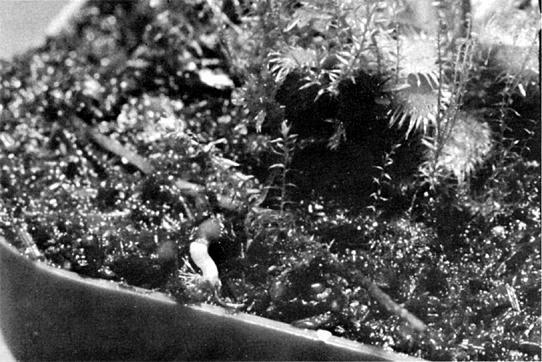 Kuntze had made Aregelia as a substitute for Nidularium on the mistaken assumption that Nidularium was not usable. Consequently, when Nidularium was divided, Aregelia had to remain with the part that was typical and could not be used for the part that was separated. The genus still lacked a valid name, so in 1934 I proposed the name Neoregelia. To the best of my knowledge then and now this has never been used for any other genus of plants." The Morris Henry Hobbs Bromeliad Association will hold their first spring bromeliad show and sale on Saturday and Sunday, April 15 and 16, 1978 at Degado College cafeteria, 615 City Park Avenue, New Orleans. Door prizes and free work shops on mounting, potting, and growing bromeliads from seed will be featured on both days. One of the most frequently asked questions at our plant sale table every meeting is "How big does this plant get?" Since space always seems to be at a premium (even in a greenhouse), here are but a few of the hundreds of small plants you may want to try. As most of us are familiar with the small tillandsias and cryptanthus, I have omitted these genera. Starting alphabetically we begin with Aechmea brevicollis, a semi bulbous plant with leaves that bend sharply outward at the top. Like many of the minis, it has a stoloniferous habit, that is, new pups appear on somewhat long, woody runners (stolons) that are easily detached and rooted. A. recurvata var. benrathii is a small gem whose inner leaves turn a brilliant red when in flower. A beautiful hybrid cross of this plant with A. comata (called A 'Covata') should be promptly purchased if you are fortunate in finding one. Another desirable mini in this genus is the lesser seen A. tillandsioides var. variegata, a dwarf version of the species with white margins and a most colorful inflorescence. Also worthy is A. pineliana var. minuta. The billbergia clan contains many small plants, one of which is B. leptopoda whose leaves form a one-inch diameter tube and tightly curl back like hair around a curler. The entire plant is cream spotted if grown in good light. A similar but even more beautiful hybrid is B. 'Catherine Wilson' (B. amoena ×B. iridifolia). With good light its leaves are covered with a roseate-creamy splotching that is most attractive. The rose bracted inflorescence has green flowers. There is also the popular B. nutans, which can clump six or more plants in a small pot. An all too rarely grown bromel is Dyckia fosteriana, a terrestrial succulent. It has very interesting silver leaves that curve in graceful whorls, forms clumps, and puts up a tall spike of gold flowers. The dyckias prefer a regular potting soil mix with drainage, strong light, and not much water. Another small dyckia is D. brevifolia. The guzmanias have a number of small bromels worthy of space. The smallest one of these is G. angustifolia, which has both red and green forms, the latter usually being smaller. Its inflorescence is dark red with yellow flowers. A slightly larger but colorful hybrid is G. 'Meyer's Favorite,' a blend of green and maroon, with an inflorescence similar to the equally mini G. lingulata var. minor. Some of the quaintest of the minis come from the genus Neoregelia which is usually known for its larger, very colorful foliage plants. Two nice pixies are N. ampullacea and N. punctatissima. Both of these have a tubular shape and are about 6 inches tall. N. ampullacea has many forms, from the shiny green to purple to maroon, banded or splotched. The flowers, in the typical neoregelia fashion, are deep in the tube. N. punctatissima's green leaves are marked with brownish spots on the undersides and white bands on top. They form a tube, but at the apex spread out on a flat plane. One of the most interesting features of these plants is their stoloniferous habit. When grown on a tree or a large slab, the offsets tend to spread out on the growing surface and root. When in a hanging basket, the pups eventually give off more offsets and one ends up with many plants, all connected like a Chlorophytum (Spider Plant). When grown in a small pot, the stolons will reach outward until they touch the rim and then turn upward. An often neglected genus is Orthophytum. The most commonly seen is the brown, soft-leaved O. saxicola. Like most orthophytums it is a champion pupper. Also most attractive is O. vagans, a long-stemmed stoloniferous plant which wanders quite a distance from the pot. At flowering time, its center leaves become bright red to highlight the pretty white flowers. In the genus Vriesea, an extremely cute plant is V. racinae, a tiny rosette with recurving dark-green leaves, heavily brown-dotted on the underside. Its green-white flowers are somewhat fragrant. The popular, tiny V. carinata with its upright red "lobster claw" spike of yellow flowers, has an equally cute hybrid V. 'Deutscher Zwerg' (German dwarf) with a similar inflorescence, somewhat pendant. These are only a few of the many small bromeliads suitable to fill your precious small spaces. A recent, sudden bout with fungus on various red-leaved aechmeas prompts this warning to other growers. Last winter, during the holidays, all air circulation fans in our university building were turned off for two weeks. In this absolutely still air the humidity climbed to 80 or 90 percent. No immediate damage appeared, but months later, as the red aechmeas and their pups grew out, the leaves showed wild, zig-zag color banding distortion. The appearance resembled virus patterns in other plants. The leaves were reasonably healthy otherwise, but slower growing and sometimes slightly wavy. However, all the plants and pups are responding very well to benlate drenching and fresher air; the newer parts of all leaves are showing perfectly clear, natural color and healthy growth. Closer inspection of other plants showed some small red spots (changing to tan centers) on one nidularium, a hybrid neomea, and two or three neoregelias. Suddenly I remembered that nearly 50 amaryllis were stored, dead tops and all, under the bromeliad shelves — and three or four of these had traces of amaryllis scorch fungus on the leaves. The benlate had been controlling the disease here, but it wasn't quite eliminated when I put the amaryllis bulbs to rest for the winter. I believe this fungus may be the culprit, for when the amaryllis went into the yard this summer, fungus blight of the same appearance showed up on nearby lily-of-the-valley leaves during the very hot, humid weather. At any rate, after observing the damage to some pups on a few of the affected aechmeas (wrinkling and quilling) which occurred during this period of fungal infection, I took the advice of a friend who had lived in North Africa: I removed and discarded the malformed pups, treated the old plants liberally with benlate, and the subsequent crop of new pups is quite healthy. I begin to suspect that occasional quilling and/or wrinkling of tender-leaved pups may sometimes be a side effect of unnoticed fungus in addition to physiological factors. I'm not sure yet, but it may be that when normally straight-leaved green bromeliads start to look "wavy," they may be carrying some fungus. Perhaps a preventative benlate treatment would be warranted when pups first appear if there is any doubt. The San Fernando Valley has long been well described as a desert, and certainly it is spotted with varying climates all through the year — all the way from dry, hot summers to a few more serious cold frosty mornings. 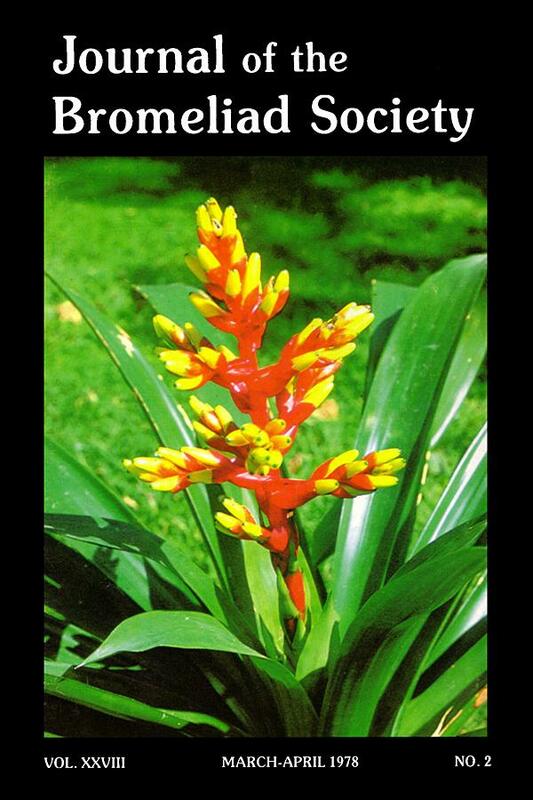 Nevertheless, it is their inescapable beauty that score bromeliads very highly with our members. They are all willing to try anything and any way to save their plants. Surprisingly, we find these tropical plants adapt very well. Although newly imported plants do need tender care at first, preferably a greenhouse, the second and third generation plants have proved themselves very hardy to all conditions. As the plants multiply all of us are gambling more and more, putting them in more risky situations, and they most always come through well. One example: Anyone with a greenhouse at one time or another finds it walls bulging and the "multiples" are then put outside. Later, a generation or two, I have even been forced to plant these extras directly in the ground. This contradicts the theory that bromeliads need a loose, friable potting mix in order to exist. My soil is a sandy loam and it seems to be very compatible with all my bromeliads. Now I have bromeliads under the dracaenas, under the apple tree and the fig tree, bordering a bed of day lilies, and mixed with a collection of agave. The latter, of course, is a dry-growing area. The dracaena/bromeliad area is damper and contains more humus. All this does not include tillandsias which grow epiphytically. This type needs the minimum of care in the San Fernando Valley — they grow very, very well for all of us. The only key to success is to be able to separate these groups for our own convenience. This is where experience is rewarding. One begins to solve a few of nature's secrets for himself. The wide variance in bromeliads lends them to endless experiment. Bravo, bromeliads! 12240 Archwood, North Hollywood, Calif.
Saturday, May 6 — 12 to 6 p.m.
Sunday, May 7 — 10 to 5 p.m. The shortage of fuel and its ever-increasing cost have recently created a predicament for many greenhouse owners. To help solve the problem, the Longwood Program in Ornamental Horticulture at the University of Delaware has produced a fine book entitled Energy Conservation in Greenhouses. This new publication offers a unique collection of ideas for fuel conservation in greenhouses. The owner who must reduce his fuel consumption will be interested in the chapters on cultural factors, greenhouse maintenance, and greenhouse modifications. For the person who plans a new greenhouse, the publication includes fuel comparisons, information or orientation and site locations, and suggestions for windbreaks. A final chapter discusses using solar energy to heat greenhouses and outlines solar collection-storage models developed throughout the country. This elegant vriesea, growing as an epiphyte in the rainforests of Colombia, may be found in various locations ranging in altitudes from 3800 to 7500 feet. It is a large plant, as its name implies, with an inflorescence reaching up to 3 feet and green, strap-shaped leaves measuring 2½ to 3 feet in length and 2 inches broad at the middle. 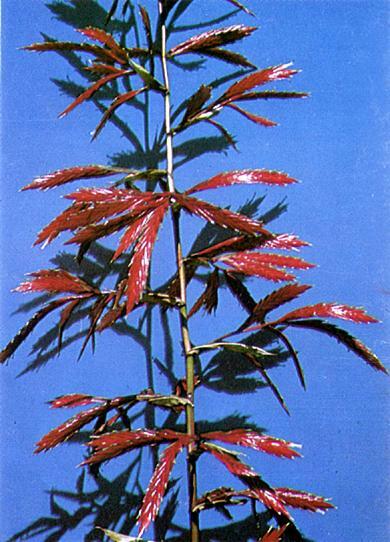 The foliage is thin, flexible, and subglabrous. 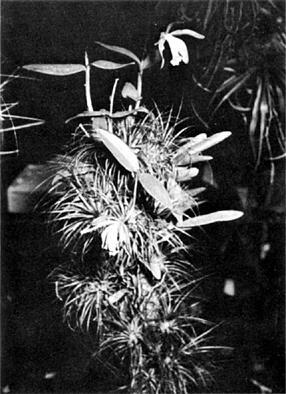 Vriesea elata was first named by Baker in 1888, who classified it as a tillandsia, as did Mez, and it was not until 1955 that it was rightly put into the genus Vriesea by Dr. Lyman B. Smith. Although it is rarely found in collections, it has been brought home by collectors and is listed in the trade.